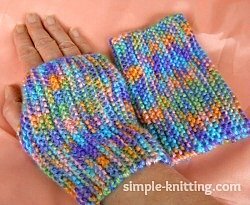 This fingerless mittens knitting pattern is a fun little beginner knitting project. It's like a 'knit as you learn' pattern where you get to practice knitting plus make something all at the same time. Fingerless mitts are a nice way for beginners to have a little fun knitting plus you're making something that will come in really handy when it gets cold outside. This simple little knitting pattern can be adjusted very easily if you'd like to make them longer. That way you can make them go all the way up to your elbows if you like. Need a couple of knitting ideas for your mittens? Try some different stitch patterns. With those knitting ideas you have the makings for some lovely knitted gifts or fingerless mitts for yourself for every day of the week. Now go pick up some dreamy knitting yarns and starting knitting these easy mittens. You can use any worsted weight yarn you like. And since these mittens are made in Garter stitch they will stretch quite a bit. You don't have to worry about knitting gauge. I only listed the knitting gauge as a point of reference. When you cast on stitches you will be casting on the length so if you would like to have them longer to go up your arm just cast on more stitches. Knit every row for 40 - 60 rows (that would be 20 - 30 garter ridges) depending on your hand size. I knit 60 rows however my hands are on the bigger side. Simply wrap your knitting around your hand to see how they fit. Snug enough? Not too tight? Just right? Awesome, then you're done. Finish: Fold square lengthwise so that garter stitch ridges form vertical stripes. Seam up sides leaving a hole for your thumb.